The concepts of mutual assistance and charity often come to mind when the concept of takaful is mentioned. This is understandable given that takaful played the role of an essential risk-sharing mechanism in Muslim history. In addition to risk sharing, new features have been added to the modern concept of takaful: investment and saving elements. This is mainly due to the fact that takaful participants who join a takaful arrangement not only seek protection but are also interested in the investment and saving services. However, the investment activities carried out by takaful operators have raised a number of questions. 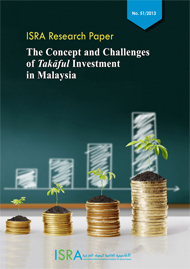 Some argue that it is inappropriate for takaful to incorporate the investment features as it will contradict the social and charitable nature of takaful. Others are of the view that there is nothing wrong with the investment activities undertaken by takaful operators as long as the investment activities are in compliance with Islamic law and the technical contractual requirements are satisfied. The issue of investment activities in takaful raises certain concerns and has resulted in various challenges to the way they are being practiced. The prevailing Shariah issues highlighted in this paper relate to investment of the Participants’ Risk Fund (PRF), charging a fee to manage the mudarabah-based investment fund, the fee paid to the fund manager, and income purification. Meanwhile, the main operational and legal challenges addressed in this paper include the participants’ involvement in the investment process, the limited investment avenues, investment fund monitoring, cross-border investments, asset-liability matching, and treatment of underwriting surplus and investment profit.